The five paintings in the Bloch-Bauer collection show an admirable clarity of development along one line only, that of reconciling the picture plane to the canvas. 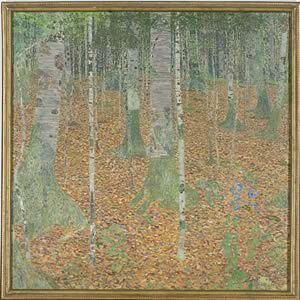 Beech Woods (Birch Woods) in 1903 puts him in the position of Rembrandt measuring for effect (as in the Hammer Juno), all the brushstrokes are meant to resolve at a distance. 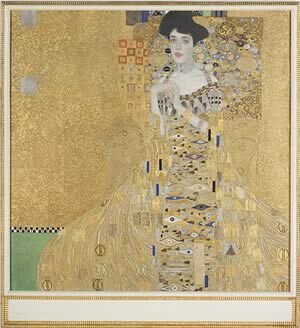 The Byzantine pictures, of which Adele Bloch-Bauer I (1907) is an example, industriously build up the picture surface in conscious ornamentation. 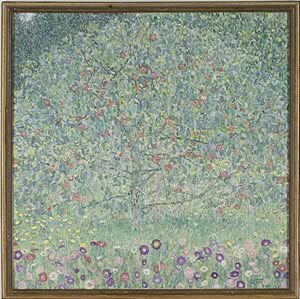 Apple Tree I (1911 or 1912) gives the result, a naturalism rendering blooms in sunlight, now with an intelligible surface out of Pissarro, say. 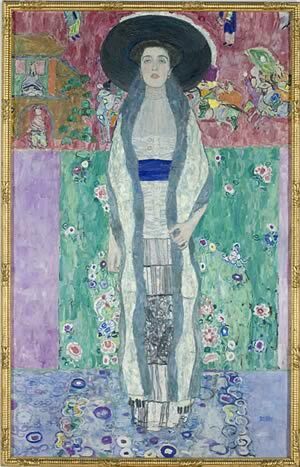 John Singer Sargent’s influence on the portraiture of Adele Bloch-Bauer II (1912) seems undoubted, and the background reckons Matisse and Van Gogh’s japonoiserie into the equation. 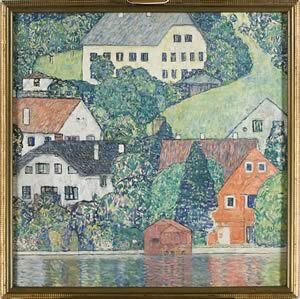 Houses in Unterach on Lake Atter (1916) has the pellucidity of Beech Woods, but has now resolved the problem, The remarkable thing, apart from the one line, is the solidity and accuracy of representation, the care of mastery and precision of craft in all five paintings, so that no one of them can be singled out.